Disney•Pixar’s Cars 3 is teaming up with NASCAR this year as crowd favorite Lightning McQueen prepares to return to the big screen on June 16. Plans for the joint effort were shared by Cars 3 director Brian Fee, Cristela Alonzo — the voice of the film’s elite trainer Cruz Ramirez — and NASCAR’S vice president of entertainment marketing & content development Zane Stoddard today at the Daytona International Speedway in Florida as fans gear up for the DAYTONA 500 (live Feb. 26 at 2 p.m. ET on FOX). 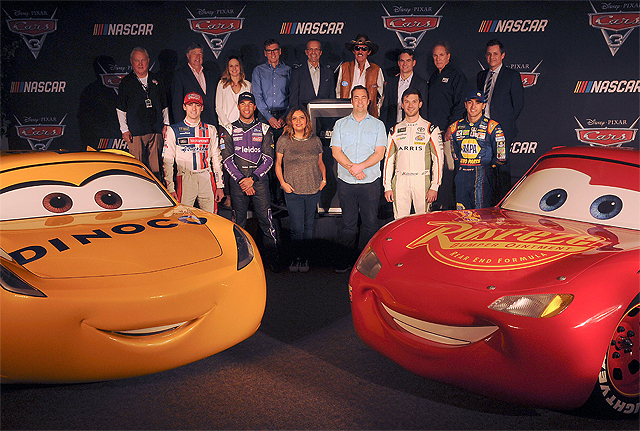 Owen Wilson, the voice of Lightning McQueen, will serve as grand marshal for the 59th annual “Great American Race.” Check out the new Cars 3 NASCAR cast photos plus a new still in the gallery below! Kicking off at the DAYTONA 500 with the premiere of a new on-air promo, the NASCAR-Cars 3 collaboration continues throughout the entire race season. · Throughout the 2017 Monster Energy NASCAR Cup Series, races will feature a Cars 3 at-track presence via a wide array of promotions. · A co-branded merchandise program with Fanatics—the first of its kind for NASCAR and the Cars franchise—will also kick off at the DAYTONA 500 featuring the first film-related product available for fans to purchase. Product will be available at the Fanatics Trackside Superstore continuing at race tracks throughout the season, as well as online at the NASCAR.com Superstore. · NASCAR Acceleration Nation, the sport’s youth program, and the NASCAR Hall of Fame will be featured throughout the full duration of a Cars 3 nationwide tour. The Lightning McQueen and Cruz Ramirez look-alike cars are slated to make appearances at select races throughout the season as part of a Cars 3 nationwide tour. Joining them on the tour will be a look-alike of Lightning McQueen’s on-track rival, Jackson Storm. Blindsided by a new generation of blazing-fast racers, the legendary Lightning McQueen (voice of Owen Wilson) is suddenly pushed out of the sport he loves. To get back in the game, he will need the help of an eager young race technician, Cruz Ramirez (voice of Cristela Alonzo), with her own plan to win, plus inspiration from the late Fabulous Hudson Hornet and a few unexpected turns. Proving that #95 isn’t through yet will test the heart of a champion on Piston Cup Racing’s biggest stage! Directed by Brian Fee (storyboard artist Cars, Cars 2) and produced by Kevin Reher (A Bug’s Life, La Luna short), Cars 3 cruises into theaters on June 16, 2017.